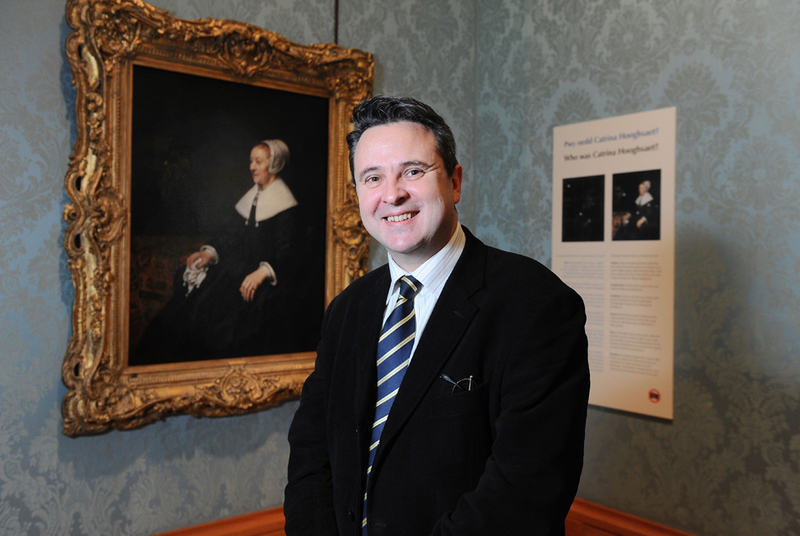 Huw Lewis AM, Minister for Housing, Regeneration and Heritage at National Museum Cardiff with Rembrandts Portrait of Catrina Hoodhsaet. CARDIFF.- Visitors to National Museum Cardiff now have another chance to see Rembrandt van Rijn's (1606-1669) Portrait of Catrina Hooghsaet, which is on special loan from Penrhyn Castle thanks to support from the Welsh Government. Museum visitors have the opportunity to enjoy the Portrait of Catrina Hooghsaet (1607-1685) until Sunday 17 February 2013, when it will return to Penrhyn Castle near Bangor - its home since the 1860s. A prolific painter, draftsman, and etcher, Rembrandt is usually regarded as the greatest artist of the Dutch "Golden Age." The portrait of the wealthy Amsterdam lady, painted in 1657, is an example of Rembrandt's outstanding talent for painting characters, not just faces. It demonstrates his ability to combine fine detail, blurred impressions and dramatic effects of light and shade. During the 1650s, Rembrandt was the most celebrated artist in Amsterdam. Today, he's recognised as one of the most important figures in the history of art and his work continues to inspire artists across the globe. Huw Lewis AM, Minister for Housing, Regeneration and Heritage said: "I'm extremely pleased that we have the opportunity to display Rembrandt's extraordinary masterpiece once again at National Museum Cardiff. It simply is a 'must see' attraction, which I'm sure that many people will take advantage of, and with it being here over the Christmas break it's an ideal time when people are off work and looking to get out of the house for a few hours. "Making art like this accessible to people, both in terms of geography and by displaying the painting in the National Museum which is free to enter is a very important part of the Welsh Government's commitment to increasing access to the Arts for the people of Wales." Oliver Fairclough, Keeper of Art said: Were delighted to have this painting on display once again at National Museum Cardiff. The portrait was here in 2009 for some months and was extremely popular with visitors so were glad its back for visitors to view over the Christmas holidays and New Year. Being able to display what is described as one of the most significant old master paintings in private hands in the UK is a special opportunity for Amgueddfa Cymru and were very grateful to the Welsh Government and the Trustees of Penrhyn Settled Estates for allowing us to share this masterpiece, which is usually central to the displays at the Castle. National Museum Wales Acquires Picasso's "Still Life with Poron"